With this iExpression you can connect a property to another one in an elastic way. This is like a linking expression, but the property followes the linked property not directly, but in a delayed, elastic way. If you connect the position of a layer to the position of another layer, they behave as if they where connected by an elastic strap. However, you can also apply it to other properties - for example to make the scale of one layer follow the scale of another one in an elastic way. Note that the expression only acts in one direction: The property that you apply the expression to follows the linked one but not vice versa. The frame (in composition time), at which the physics simulation is started. 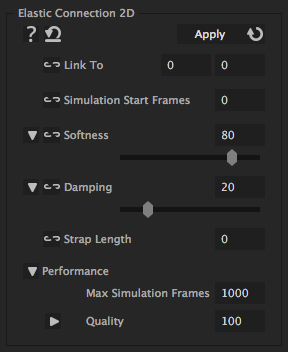 Link this value to a slider and keyframe it with a few hold keyframes to restart the simulation at several times. Several shorter simulations compute much faster than one long one. Hence, best start a new simulation whereever the property "takes a break" and does not move. At times where the simulation should not be active, just keyframe the simulation start to some frame after the current frame (say 9999999) to avoid unnecessary calculations. The softness of the elstic strap. The bigger, the slower and more delayed the object follows the elastic strap. This is like the friction of the object being pulled by the rubber band. The higher the less it oscillates and the slower it moves. The length of the elastic strap. For 0, the strap always pulls the object until its exactly placed at the linked property. FOr larger strap length, the strap stops pulling earlier. For 250 at most the last 250 frames are considered during the simulation, even if the time spans resulting from "Simulation Start Frames" are longer. Setting this parameter to something shorter than the duration of the simulation might cause inaccurate results, but for large numbers, the expression might become very slow.